At ActBlue we’re committed to dreaming up new ways for you to visualize all of your data. 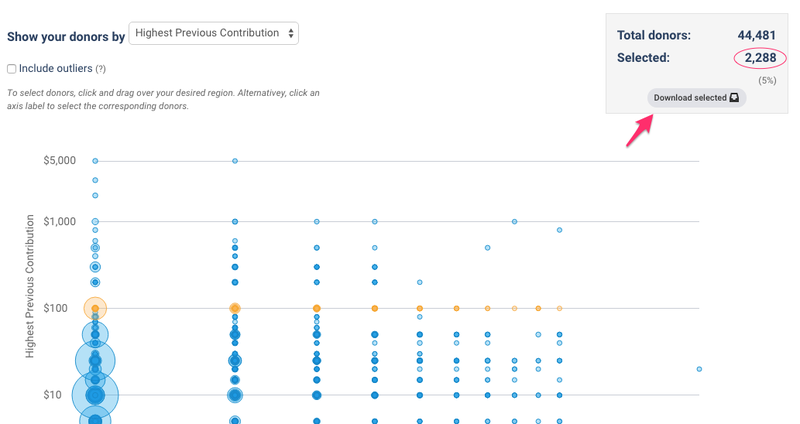 In that spirit, our tech team just rolled out a new way for campaigns and organizations to analyze contributor data by tracking HPCs (highest previous contributions) and total contribution amounts by individual donors. This new visualization provides amazing insight not just for technically skilled data people, but also for smaller campaigns and organizations. 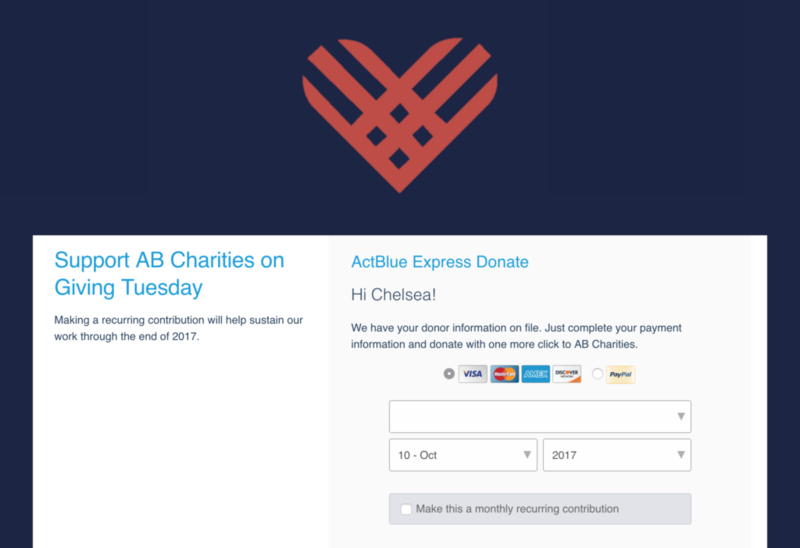 The chart allows users to select groups of donors based on their donation history and download their email address and contributor information. That means teams that don’t currently have the ability to segment and target donors can now instantaneously create a segmented email list! You can toggle between the HPC and total contribution views of the graphed data at the top. This chart has a log scale for both its x and y axis. A log scale increases by an order of magnitude, rather than a fixed amount, which allows us to present a clearer picture of your data. What does that mean? 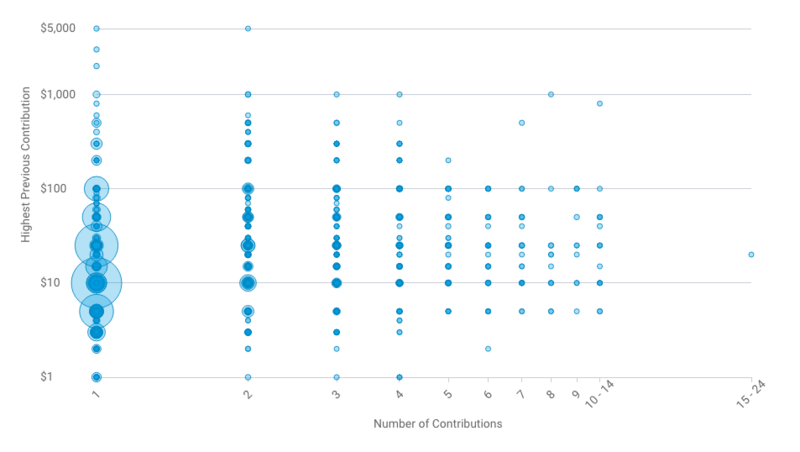 If you look at the x-scale, you’ll see there’s more space between 1 contribution and 2 contributions than there is between 8 and 9. There are far more people who gave just 1 contribution, but on a regular graph all those dots would be stacked on top of each other. So, by choosing a log scale, we’re able to show you more of your actual data. The x-axis shows the total number of contributions a donor has made to your campaign or organization in their lifetime on ActBlue. 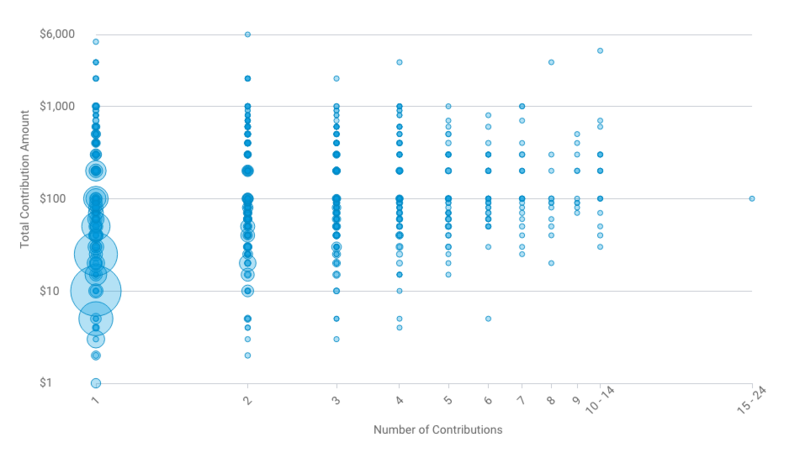 The y-axis shows the donor’s highest previous contribution, or the total amount that they’ve donated, depending on which view of the chart you are looking at. For values on the x-axis, contribution numbers above ten are rounded to the nearest ten. It’s unlikely that you have contributions ranging in the hundreds, but in that case they are rounded to the nearest hundred. The graph itself gives an insight to highest previous contributions for your entire donor base, along with information on how many donations people have made. But it doesn’t end there. 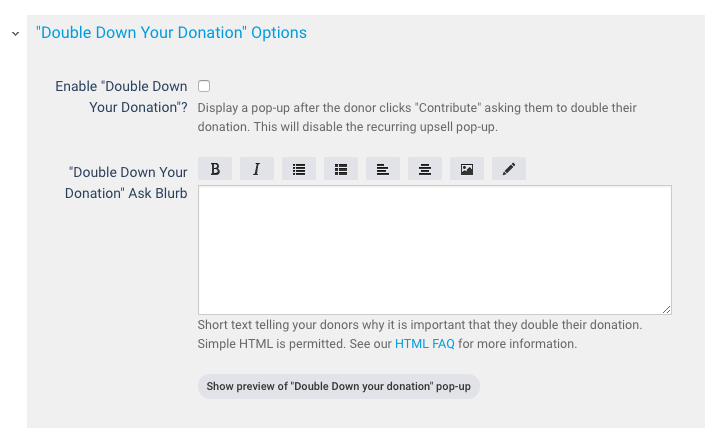 Click a dollar value or a number of donations to highlight a row or column. You can switch to the other visualization to see how their total volume corresponds. More importantly, you can download a CSV of the email addresses and the corresponding contribution data from a column, row, or selected range of the graph. To select a column or row, just click on the corresponding value and click “Download selected” in the upper right hand corner. To select a custom set of data, you can drag your mouse to draw a box around your desired values and then download the data. For example, we’ve seen a lot of success in our program by targeting donors based on their HPC. 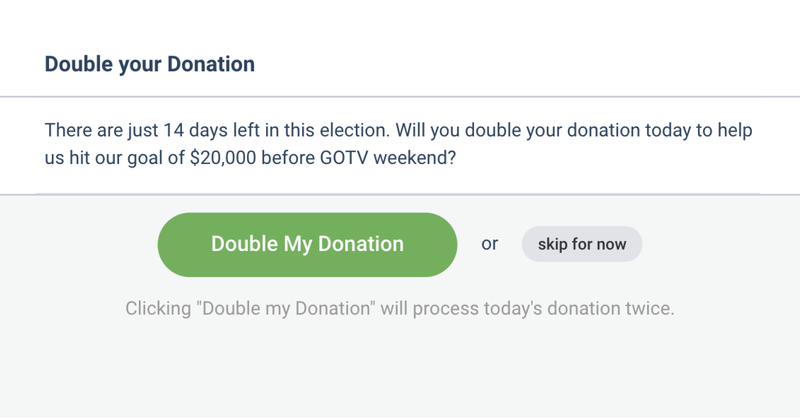 For low-dollar donors, we’ll ask them for $5, while higher-dollar donors are asked for $10 or $15. With this chart, you could download a list of $3 and $5 donors and then send a personalized ask to that group. 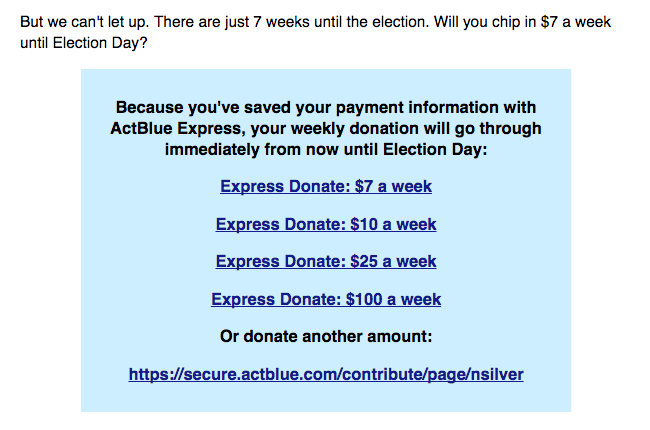 If you have a big enough email list, you could try sending a $5 ask and a $7 ask, to see if donors would be willing to give just a bit more. 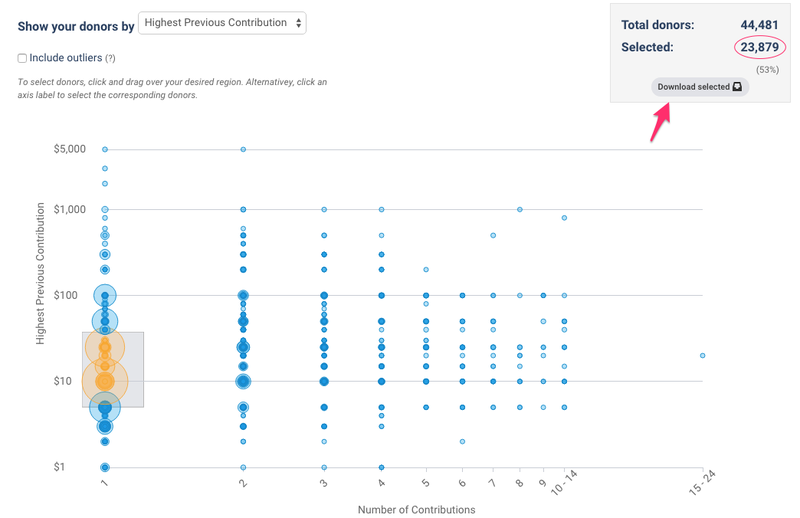 You can also toggle the graph to show outliers (people who fall outside the scale of the graph), if you’re interested in targeting those donors. 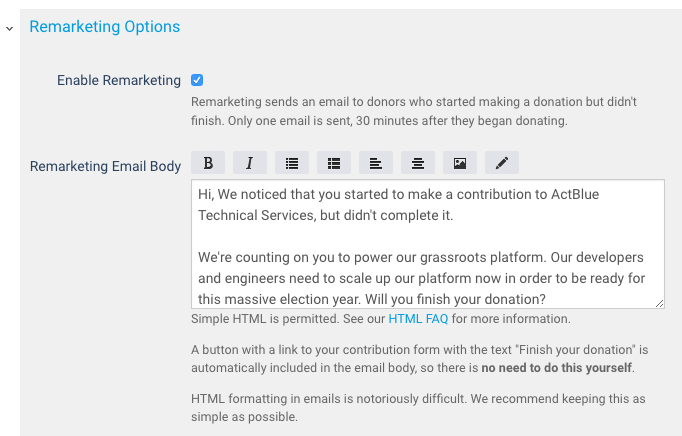 We hope that this new tool will allow you to get to know your donors in a more nuanced way and run an even better email program. *We chose this rounding scheme to simultaneously maximize the granularity of useful information and minimize unimportant visual clutter. 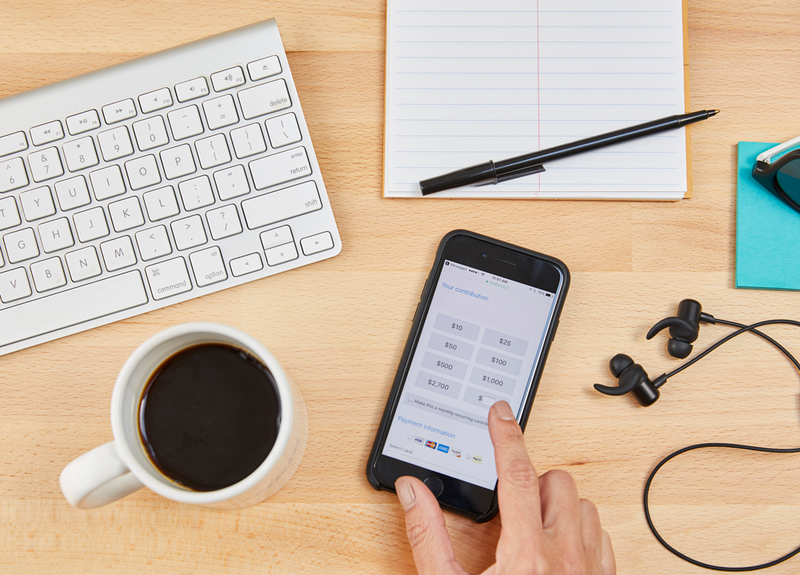 This post is the fourth in our blog series on testing for digital organizers. Today I’ll be talking about implementing your A/B test. This post will be full of helpful, quick tips. So, we’ve discussed some things you might want to test, and some other things you might not want to test. Then, we walked through a simple way to figure out the number of people you’ll need in each of your test groups, which number depends on the smallest difference you’d like to reliably detect.1 Now what? Well, the short answer is “run the test”, but of course it’s never that simple. Your next specific steps depend on what you’re testing, as well as which platform you’re using to run the test. There are too many possibilities for me to go through each one, but I can provide a few quick tips that should apply to you regardless of your specific situation. First, make sure you have a reliable method of tracking your variations’ performance (like reference codes or an A/B testing tool (here are instructions for using ours)), and make sure you actually implement that method. This may sound like a no-brainer, but we’ve seen plenty of people start what would otherwise be an excellently set-up test with nothing to measure the variations’ relative performance! Is there a joke here about the “results” of the test? Groaners aside, pointing out that error isn’t at all to make fun of the people who have committed it. Rather, we’re all busy, and things can get hectic. Having this on your pre-send checklist2 will save you from the realization that a lot of time spent thinking up a test, creating the content, and so on ad nauseam was all for naught. What’s an example? Well, say you’re testing email content for donations. 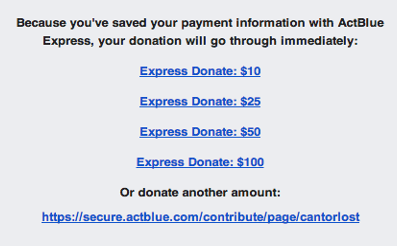 And of course, you want to use the best online fundraising software in the whole wide world, so you’re using ActBlue. Well, we have a handy feature that allows you to generate reference codes to track donations. We have a full instruction guide for using reference codes on our tutorial, found here. If you’re testing two different versions of your email, you could attach the URL param3 refcode=variation_a to the links in your first email and refcode=variation_b to those in your second email. Then, when you go to https://actblue.com/pages/[YOUR_PAGE_NAME]/statistics, you can measure the performance of each email. The information will also appear in a .csv download of your contribution form donations. We also allow a handy refcode2 URL param if you want to conveniently subdivide your tracking. Conceptually, it’s the exact same thing as refcode; it’s value lies in the fact that it’s an extra place to store information. Think of a backpack with an extra divider on the inside for sorting your stuff. This is the internet version of that. For example, we use this for tracking link placement in the email. The need for refcode2, however, indicates that your test might be a bit complicated (i.e., there are more than just two variations, so setup and evaluation of the test is a bit outside the scope of the tips in this testing series.) 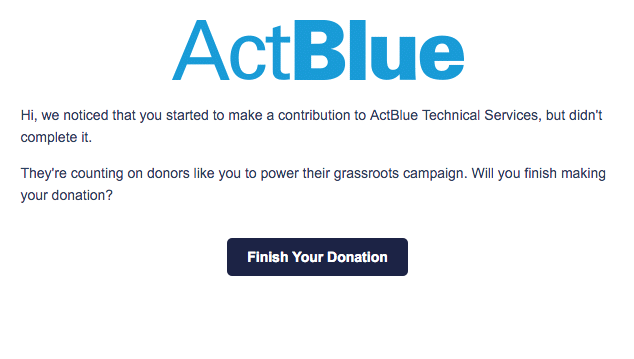 That’s no problem, but you might want to shoot us an email at digital [at] actblue [dot] com to have a chat about test setup and design. My second tip is related to groups. Taking your list—or some subset of your list—and dividing it up into smaller, randomized groups is a step that you’ll likely do in your CRM or email tool. Unfortunately, I can’t provide detailed instructions for each one. Chances are, though, that your CRM has an instruction page on how to do this within their software.4 In any case, this step is critical: without at least randomizing before conducting your trial, you’re setting yourself up for failure. Here’s an example of how to do it wrong: let’s say you’re testing two emails, and even though you’re not sure which one is better, you have a hunch that email B is better than email A. So, not wanting to lose out on money, you decide to assign 20,000 people with the highest previous donations to group B and 20,000 people with the lowest previous donations to group A. That way, you can conduct the test to find out which email is definitely better, but not have to lose too much money along the way, right? Well, that’d be great, but unfortunately it’s all wrong. Assigning your groups that way would all but ensure you draw false conclusions about your test–email B is all but certain to bring in more donations, but it’s because it was assigned high-propensity donors, not necessarily because it’s the better email. Make sure you’re at least randomizing (with a proper algorithm, q.v. footnote 4) before splitting your groups and implementing your test. My third tip is short and sweet. After you do all of this legwork, how do you know that the right variations were sent to the right number of people? What if you’re working with eight groups instead of just two? Well, the answer is that you don’t really. But, that can (and should!) be remedied. Place your own email address in each of the test groups. This won’t significantly affect the results of the test, but it will allow you to be sure that the right variations were sent. “But, I only have one email address, how can I put myself in multiple test groups without the hassle of creating new emails?”, you ask. Use the old email-campaigner’s trick of adding a “+” to your email address if you have a Gmail-based address. 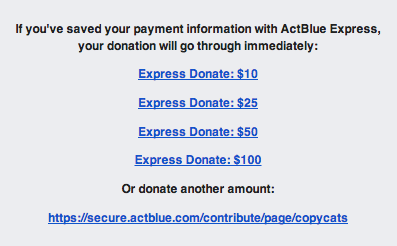 For example, if your email address is janesmith@actblue.com, you can add janesmith+test_email_a@actblue.com to group A and janesmith+test_email_b@actblue.com to group B; they’ll both be delivered to your inbox, and you’ll be able to perfectly spot whether the variations were sent correctly. I get it. You spent a lot of time setting up a test for these awesome variations of, say, a contribution form, and even though you know you need to wait until 15,000 people land on the form to see results, you want to check what’s happening? Has either taken an early lead? etc., etc., etc. You can check what’s happening along the way, but you should definitely not stop the test early because it looks like one variation is performing better.5 This is a really common mistake, but a deadly one. I can’t stress this enough. The more times you test two variations for significance (which we’ll talk about in a future post) before the required sample size is hit, the more likely you are to detect a false positive. In fact, you can pretty quickly render your test effectively useless. So, if you just have to see what’s going on, fine, but promise yourself and statisticians everywhere that you won’t act on what you see! Ok, that’s it for today! Next we’ll talk about evaluating your results and even more importantly, learning from them! 3 A way of passing messages from the URL back to the website which it can use to customize the display or data recorded. 4 Now, this is generally the most basic possible insurance for proper group setup, as most tools will do nothing more than randomize and divide. There are other steps that should be taken for running anything more complex than a simple A/B test, which steps tend to best be done with a statistical tool such as R. If you think something more complicated is in-line for your program, don’t hesitate to shoot us an email (digital [at] actblue [dot] com)– we’d love to work with you to see if something more complicated is in order, and if so, we’d be glad to help. 5 Saying “definitely” in a conversation about statistics is— if also delightfully ironic— a bit misleading. This is actually a really complicated topic with plenty of proffered solutions, which range from minor adjustments in your calculations to an entirely different philosophical approach to statistics (I mean, who knew, right?). Those are all great discussions to have, but for now, it’s probably best to just assume you shouldn’t repeatedly evaluate your test variations before you hit your required sample size. Ok? Cool. Why? Well, it turns out that you can raise slightly more money by sending an Express Lane-structured email to your entire membership. Traditionally, list admins send two distinct emails; Express users see Express Lane links, while everyone else gets an email with “regular” links. With Express Lane to all, you can send the same Express Lane email to all of your users, saving you time and opening up the possibilities for groups with smaller lists. There’s been a lot of testing done both by us and other committees on sending Express Lane emails to everyone. The general consensus is that Express Lane structure to non-Express users does perform slightly better than normal links. We’ve tested sending Express Lane links to non-Express users 4 different times. Consistently, we see more money (the net bump is around 6-7%), but these results aren’t statistically significant. Others are seeing similar gains. While we’d love to see statistical significance, we think it’s still a great idea because there is a tremendous upside potential for both groups and campaigns that are already using Express Lane and those who have yet to try it out. 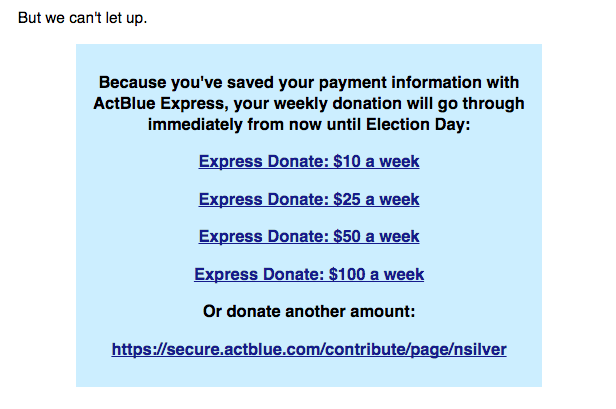 It’s a time saver for smaller groups and also encourages your members to save their information with ActBlue and become an Express user. Our recommendation is that groups and campaigns test this with their membership and confirm that they are getting similar results before making this a best practice. There is some reason to believe that we’re seeing a novelty effect, since the new link structure is unusual. We’ll test this again in the future to make sure that the results are still holding, and we urge others do the same. This tactic works particularly well for groups with smaller lists. We’re confident enough in the testing to tell you that you’re likely to raise more money from sending Express Lane to your entire list, especially with the strong growth in the Express universe (994k users and counting!). However, pay attention to future posts, in case we do find that there is a novelty effect.